There have been many stories I’ve read about how people love to shop at big box, warehouse-style stores like Costco, Sam’s Club, and Walmart to save money. These kinds of stores have long been hailed as the places to shop to save money. Somewhere along the line, it became the norm to actually pay some of these places an annual fee for the privilege of shopping in their stores (Costco and Sam’s Club) whether you’re feeding a family of 20 or a family of 3. What I can’t figure out is how this became acceptable, and why so many people buy into it. I live really far out in the country in a city with only about 3,000 people. We don’t even have a Walmart in my town (which I’ve always been very proud of), but somehow we landed the region’s only Costco warehouse store about two years ago. I wasn’t pleased with the new addition. I live a very frugal life, and I’m here to tell you that, yes, you can still save money by avoiding warehouse stores altogether. You don’t need a warehouse store membership where you have to pay them before you can even step foot into their store. That’s ridiculous! Here’s why you’ll never see me shop in a warehouse store again. My problem with these types of stores started with Walmart. The bigger those stores grew in the last couple of decades, the more agitated I became with the whole shopping experience. I hated walking into the store after parking a mile and a half away, with a small list of just a few items I needed to get to start dinner. They really know what they’re doing by strategically placing many common items across the store from each other, and they use their store’s size to their full advantage. They put the toothpaste on one side of the store, the diapers at the back, and the produce on the other side, which results in running across the store and back to find what you need. They do this on purpose to try and get you to come across items you didn’t realize you needed until you saw them, resulting in you spending more money. I always seemed to fall for it since I don’t wear blinders while I’m shopping (and I don’t know many people who do!). You then get to stare at all the chap stick, candy bars, and gift cards to tempt you into parting with even more of your hard earned money. Once you finally get outside, you walk the mile and a half back to your car. It’s a joke, and the worst part is the joke is on us. A “good deal” isn’t a really good deal if you didn’t need it in the first place, and that’s how places like Walmart make a lot of money off of you. Just because you spotted something on a a clearance shelf there doesn’t mean it’s a good deal. A good deal isn’t found by browsing random merchandise, but rather in knowing what you need ahead of time, researching different places to purchase it, and then delaying the purchase if possible in hopes of finding it later at a discount. With continuous “sales” going on and items marked down before they even hit the shelf, consumers have forgotten how to shop for real deals, and stores are capitalizing on that. Remember the JC Penney’s massive marketing fail a few years ago, where they did away with all of their sales in order to promote one low, reasonable price for their goods? The failure of that straight forward marketing scheme ultimately got their CEO fired, so that should tell us enough about how stores market to us today. Avoiding shopping as much as possible and shopping at smaller stores (with smaller selections) when I do need items discourages me from impulse shopping on bogus deals and clearance items. If that’s what I have to do to avoid unnecessary spending, then I’m okay with that. After growing too much disgust for Walmart, I then turned my attention to Target, which is still a huge weakness of mine. I thought I was doing better by shopping there, but let’s face it, Target is really just a fancier (read: more expensive) version of Walmart. They carry far more home goods than Walmart does, so walking in there, for me, was like a train wreck. I could blow so much money in such a short amount of time! Although I don’t hate Target quite as much as I do Walmart, I did stifle my shopping binges trips to Target. If I actually need something from there now (which is rare), I simply order it online so I don’t have to step foot into the store. I can count on one hand the number of times I’ve walked into a pay-to-shop warehouse store (with a friend who had a membership), and each time I’ve gone I’ve been relieved to finally leave the store. I find nothing appealing about the warehouse store “look.” It’s not like I need fancy store lighting in the places I shop, but these stores clearly try to make it look like a warehouse to give you a greater impression you’re saving money by shopping there. I hate the lighting, the concrete flooring, and the huge pallets of plastic-wrapped junk stacked three stories high. It reminds me of how much excess we have in our country, and I don’t like the feeling it gives me. Do They Really Save You Money? Unless you’re feeding a family the size of the Duggars, I don’t think they save the majority of people any money. If you’re like me, when you visit those bulk item stores like Costco, you end up with a case of green beans, a case of toilet paper, and an economy sized box of toothpaste. Before you know it, you’re walking out of there with $175 fewer dollars in your pocket, and you’ve got nothing to put on the table for dinner (unless you want to eat a ton of canned green beans). The bottom line is when you become a member of a Costco or Sam’s Club, you’re paying money just to shop in a store. Why anyone would want to pay an annual fee just to come in to peruse the goods of a store is beyond me. I’m not going to pay for the privilege to shop anywhere under the guise of “saving money.” By marketing to their customers as being members only, not only are they taking money from you in the form of an annual fee, but they’re also encouraging you to shop there often so you can get your money’s worth out of your annual fee. It’s called member loyalty and they have a huge marketing department to encourage this. I’d rather spend 50 cents or a dollar more on a product by shopping at a small, local store – even my local grocery store, just to avoid going to any of those stores. I’m saving money that way by avoiding them altogether, and supporting local business in the process. I realize not everyone is an impulse shopper like me, but that’s where warehouse stores make the most of their profits. They aren’t making money off the cheap case of green beans they advertise to get you in the door, but rather all the other cheap goods that jump into your cart before you hit the checkout line. I’m talking about all of those impulse buys they have in the middle of the store that aren’t sold in bulk. Be mindful when you shop these stores (if you continue to do so), and shop only with a list and a set budget to reduce your temptation to buy other items. You can also choose to shop local stores to support your community and small business owners, which is good for all involved, even if you have to spend a few extra dollars to do so. I clearly have a major problem with warehouse stores, and I need to avoid them at all costs, which I do. Instead, I try to support small, local businesses, because every time you open your wallet, you’re voting on what businesses you choose to support. I choose to vote locally. How about you? 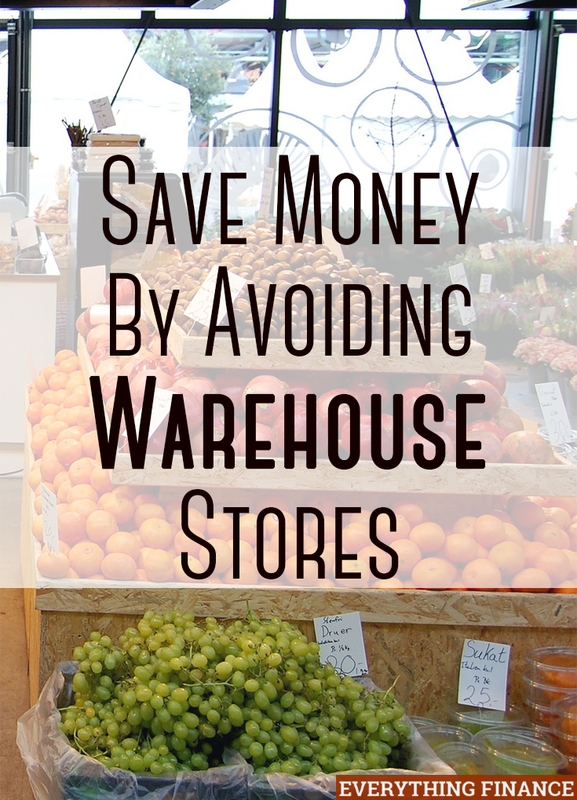 Do you think shopping at warehouse stores saves you money? How? Do you like shopping at warehouse stores?